Located outside of Kalamazoo, Michigan, we are a family of strict hobby breeders who thrive on showcasing our dogs' talents. All of our dogs live in the house as part of the family and we would have it no other way. 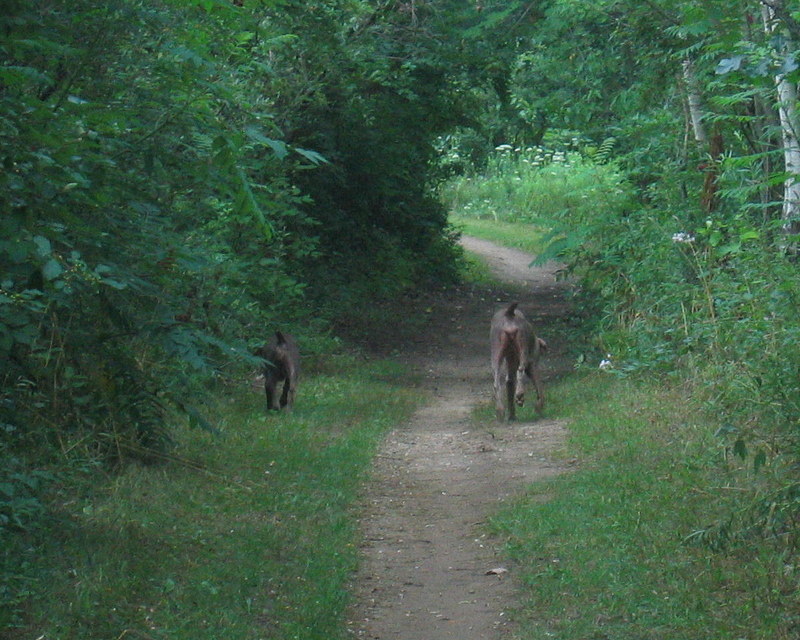 We have been active members of both the Southern Michigan Weimaraner Club and the Weimaraner Club of America for nearly 30 years and have been reputable breeders of quality Weims for just as long. Our passion lies in Field Trialing, however we are active in many other areas of AKC, WCA and UKC competition, including Hunt and Ratings tests, Conformation shows and Rally / Obedience trials. We encourage all Weim owners to explore the many events and activities available as they provide jobs for Weims while building stronger relationships between them and their people. We breed rarely, always to improve this wonderful breed and we sell only to quality homes. Our breedings are carefully planned to ensure phenomenal hunting instinct, optimum health and temperament. Because of this our dogs have natural hunting instinct which we nourish from a young age and encourage in their new homes. A word of caution: when considering a Weimaraner for your family, please keep in mind that this breed is an intelligent and highly active breed. Weimaraners thrive on teamwork and application. These characteristics make them well suited as hunting companions. Both mental stimulation and physical outlets are a necessity with the young Weimaraner and may pose a challenge to unsuspecting owners. If you are unsure if you will be able to provide these outlets, please take some more time to get to know the breed before settling on the gray ghost. 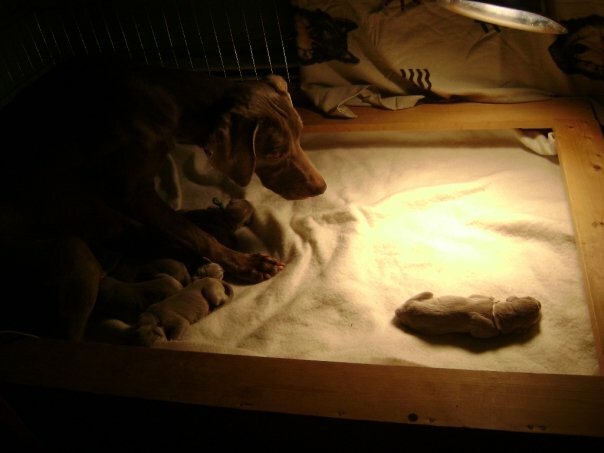 More information may be found on our "The Weimaraner" page, on the Weimaraner Club of America website, on local club websites and on numerous Weimaraner Rescue organization websites (some links here). The origin of our kennel name is the combination of my parents' names: Paul and Mary. Our first Weim, Briney, was a wedding present between my parents, purchased from Bill and Barbara Auerbach nearly 30 years ago. 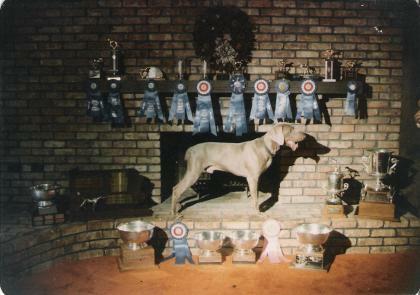 Briney (pictured above) was an outstanding field dog and highly competitive all-breed contender. He was known for his extended range and flashy hunting style. Briney was ranked first in the WCA Top Ten Derby and All-Age/Gun Dog categories in his time and won his National Futurity and Derby competitions. He had accumulated 18 Field Championship points (14 of which were from major wins), but due to a miscalculation, he was shy one retrieving point for his title. Our family now consists of my mom, Mary, myself and 2 siblings, and our Gray Ghosts. We currently have 5 Weims collectively, ranging between the ages of 8 months and 8 years. These include a grandaughter, great grand-son and great grand-daughter of Briney. We also have a mother and daughter from show lines. All of them are accomplished in the competitive arena. We are ethical, reputable breeders and take pride in our Weims. While other varieties of weims are beautiful, we gladly follow the WCA breeder code of conduct. This means that, when we do breed, we only breed healthy, silver-gray or gray, short-haired Weimaraners that conform to the national Weimaraner Standard. Our primary initiative is to improve the breed through health, hunting ability, temperament, trainability and structure. We do require that new puppies complete a beginning obedience or similar course with their new owners as a way to build a working relationship between them and to promote proper socialization. In addition, we ask that all our owners maintain Futurity eligibility on their puppies and that they have their puppies evaluated for field competition. All of our puppies are sold with a health guarantee against any congenital diseases including but not limited to heart murmurs and elbow/hip displasia. For a list of health problems that can occur in the breed, click here. In addition, we follow the minimally invasive vaccine policy set forth by the Weimaraner Club of America. If you are interested in becoming part of the Palimar Family, please Contact Us.